Plants of African violets are perennial herbs, rosulate or caulescent or creeping. Stems are often fleshy and can produce adventitious roots. The leaves have distinct petioles and are arranged alternately (rosette growth) or oppositely in plants with creeping stems. The leaves are simple and are oval to triangular in shape. Leaf margins may be smooth are highly toothed. Leaf blades may be fleshy and the upper surface is usually characterized by hairs of differing lengths and densities. The underside of the leaves can be white, silver or red–purple. Streptocarpus ionanthus ssp. 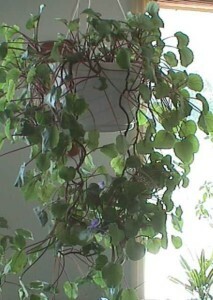 grotei showing trailing habit. 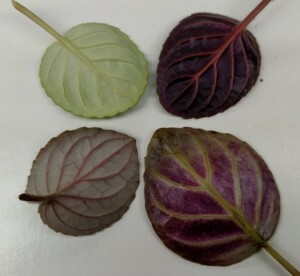 Backside of various leaves showing variation in red backing.